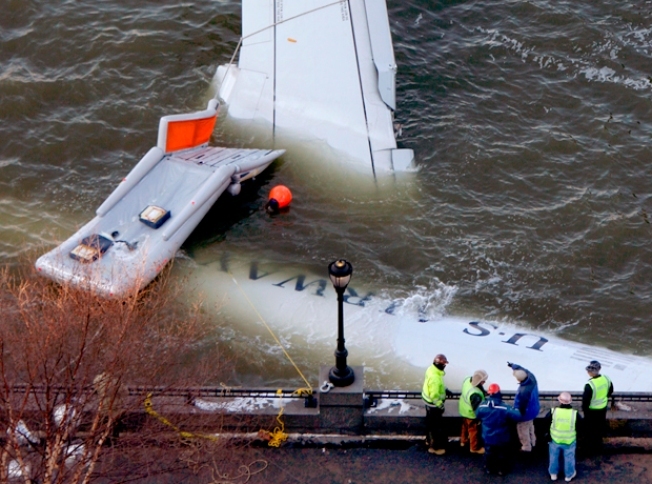 Emergency personnel look over a submerged U.S. Airways plane that crashed into the Hudson River on Thursday and was towed to the Manhattan shoreline for further inspection on Friday. Federal investigators said Saturday that the right engine of the miracle US Airways jet is still attached to the plane, contradicting their earlier statements that it broke off after the plane hit the water. A National Transportation Safety Board spokesman said the water was so murky that crews couldn't see the engine still on the plane. "We're now looking for one engine, not two," NTSP spokesman Peter Knudson said Saturday. 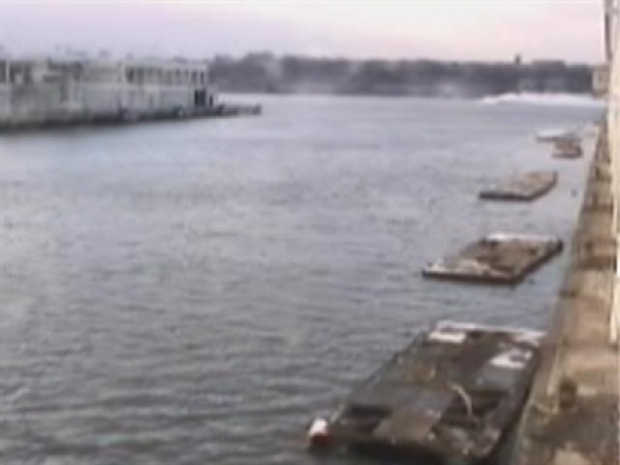 911 Call: "It's On Fire"
Yet another video was released Saturday of the dramatic jet landing on the Hudson River, this one coming from the Ferry Terminal on Manhattan's west side. A witness called 911 minutes after a doomed US Airways plane took off and reported hearing a big boom and seeing the jet on fire. The newly released 911 calls reveal the drama of Flight 1549 from almost the minute it took off. The man in the Bronx told 911: "I'm witnessing an airplane. It's going down. It's on fire." He later said that the plane was turning, and, "I don't know where it's gonna fall." Article, Video: Pilot's Final Call: "We're Gonna Be In The Hudson"
The pilot, affectionately known as "Sully," met with Mayor Michael Bloomberg on Friday. "He was as cool and calm as you could possibly hope for, and in all fairness, as you would expect form a pilot from a great airline with an enormous amount of experience and training," Bloomberg said of the hero. Sullenberger was forced to land the plane safely on the river when birds got caught in the engine moments after takeoff from LaGuardia Airport. Everyone made it out of the plane alive, and only a few injuries were reported. "There's not a million pilots who could (land the plane)," said Sullenberger's sister, Mary Wilson. "There's just a small number. And he did it. He could have made some little mistake, but he didn't." Certainly the landing was extraordinary, but so, too, were the efforts of those first responders who began the rescue within moments. One of the first ferry captains to get a boat to the landing site was 20-year-old Brittany Catanzaro, who said she doesn't consider her actions heroic. "I don't take myself as being a hero," she said. "It's our job. We're trained to do it. If there's an emergency set up, that's what we were supposed to do." New York Waterway spokesman Capt. Vincent Lucante described the conditions of an infant and a toddler who were among those passengers rescued. "It was beautiful," he said. "We brought them onto the boat. They were nice and calm. They got up to the second deck of the boat, where it is the warmest. And they started to cry, which was the best sound we could hear. And then everybody had smiles." Thursday's flight was bound for Charlotte, and many of those passengers returned there on Friday. "I just knew that we were going to make it," Donald Jones said. "I've had rougher landings on regular runways." Added Mary Ann Bruce: "I was thinking about how I was gonna live. I just wanted to see my kids and my husband again."